Autopilot system is a mechanical, electrical or hydraulic system which allows an aerial vehicle or ships to run without any assistance of human factor. This autopilot system stores data from inertial measurement instruments. Further, by using those store data it takes corrective action in order to guide the aerial vehicle. An autopilot system also maintains the orientations of the aerial vehicle or ships by monitoring the related run data. There are three major level of controls used in autopilot system including single axis autopilot control, two axis autopilot controls and three axis autopilot adds controls. Global autopilot system market is expected to grow at a robust compound annual growth rate of 6.1% during the forecast period i.e. 2017-2024. The global autopilot system stood at revenue of USD 2.95 Billion in 2016. Further, global market is projected to reach at a valuation of USD 4.4 Billion by the end of forecast period. High investment by airline companies in order to adopt advanced technologies including autopilot system is a key factor which is anticipated to bolster the growth of global market for autopilot system. Further, rise in air travel and water transportation activities are also major factors which are predicated to fuel the growth of global market of autopilot system. In terms of geography, North America has been accounted for the maximum share of the overall market. U.S. has been the dominating market for autopilot system in North America region. Growing adoption of automation technologies and huge investment by airline companies in order to adopt advanced technologies is expected to foster the growth of North America autopilot system market. Europe region is the second leading market of autopilot system and is anticipated to witness satisfactory growth during the forecast period. Presence of large number of airline companies and growing adoption of autopilot systems in aircrafts are some of the major factors which are predicated to escalate the growth of autopilot system market in Europe region. Additionally, U.K. has been the major contributor to the growth of European autopilot system market. 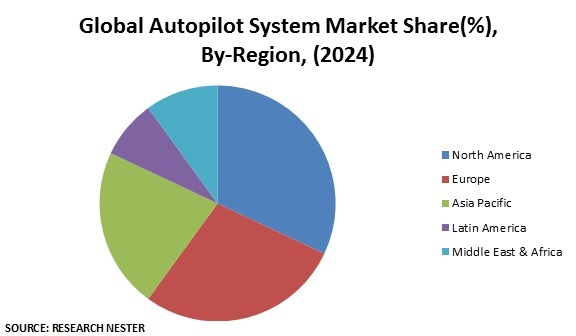 Global autopilot system market is primarily driven by increasing air travel all across the globe and growing adoption of advanced autopilot system by leading airline companies. The major airline companies are investing high capital for technological advancements of aircrafts. These technological advancements with aircrafts including adoption of highly advanced autopilot system are a major factor driving the growth of global autopilot system market. Furthermore, rising ocean trading activities and water transport are also fostering the growth of global market. Presence of strict rule & regulation in order to ensure safety of the aircrafts with real time data on board is also a major factor which is fueling the growth of GPS segment. Moreover, rising prevalence of autonomy technologies and advantages of autopilot systems such as improved fuel efficiency of aircraft and offer long journey distance are also major drivers to the growth of global autopilot system market. In addition to this, rising adoption of autopilot systems in UAVs and drones is a major factor which is anticipated to bolster the growth of autopilot system market in near future. However, low compatibility and inaccuracies in the software are some of the major factors which are expected to hamper the growth of global autopilot system market. Additionally, high cost associated with maintenance of autopilot systems and changing government rules regarding autopilot system implication are also restraining the growth of global market.